This year, I wanted to make a dessert that would fit the New Years spirit of flashy spectacle, so I decided to make a classic show-stopper of a dessert, the croquembouche (literally “crunch-in-mouth”) or less elegantly, the cream-puff tower. I don’t know what led me to think I could make this, considering the previous two times I tried to make choux pastry were huge failures. The first time, the dough was thin and clumpy and the second time the shells came out looking like carbonized hockey pucks. 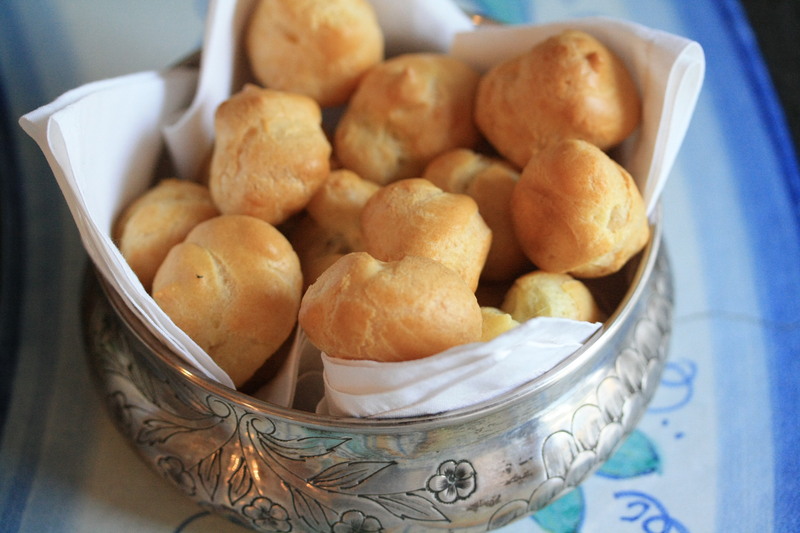 However, when I tried again I found choux pastry remarkably easy to make. You should definitely not be intimidated by the fancy French name. 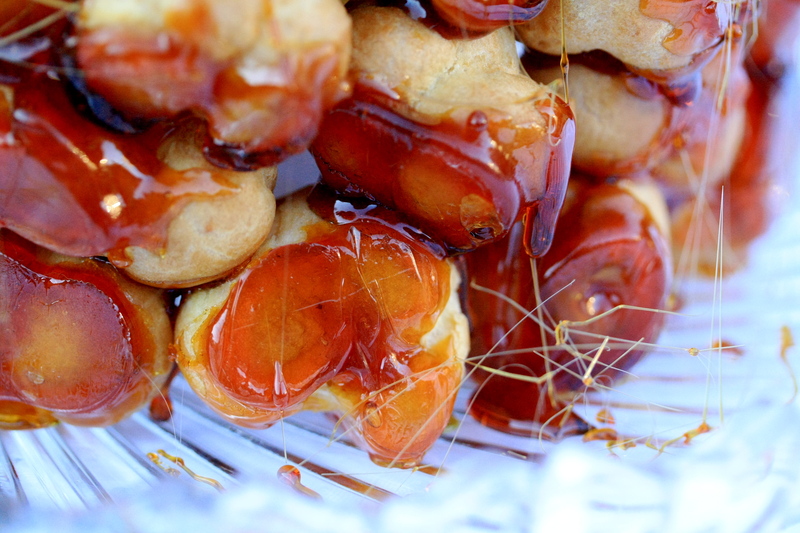 Here is my tutorial on how to make a croquembouche, so you can sound super pretentious and impress your friends when you make it for your next party. Preheat the oven to 450 degrees F and prepare a pastry bag with a 1/4 inch round tip or slightly bigger. Line a couple of baking pans with parchment paper. In a large pot, combine the water and the butter cut into chunks and bring the mixture to a boil. In a separate bowl, mix together the flour, sugar and salt. When all the butter is melted, remove the water mixture from the heat and add in the flour mixture all at once. Stir to incorporate and put the pot back on the heat, stirring constantly until the dough forms a ball that leaves a thin film on the bottom of the pan, about 1 minute. Tip the dough ball into a bowl and allow to cool completely, stirring if you want to speed up the cooling process. Once cool, incorporate the eggs one at a time. It will look like they will not want to mix in, but keep stirring and eventually you will have a uniform, sticky dough. Put the dough in your pastry bag and pipe small balls of dough onto your baking sheets. I made them about 1 inch in diameter, but I found them a little small, so I suggest increasing that to 1.5 inches. Bake at 450 for 10 minutes, then lower the temperature to 350 and bake for another 10. Remove from the oven and let them cool. You can make these in advance and freeze them in an air-locked container. Bring the milk and cream to a gentle boil in a medium pot with the lemon rind. Remove from the heat and let the lemon infuse the milk with flavor while it cools completely. In the meantime, beat the yolks with the sugar until light and fluffy, then beat in the cornstarch. Remove the lemon rind from the cooled milk mixture and mix in the egg mixture. Return the pot to low heat and cook until the mixture has thickened into a dense cream. Pour the cream into a dish and allow to cool to room temperature, covering it with plastic wrap pressed onto the surface of the cream to prevent the formation of the thin skin that happens during cooling. Pastry cream can be prepared 2-3 days in advance and kept in the fridge, well sealed, or frozen for up to a month. Combine the sugar and water in a pot on the stove and stir to dissolve the sugar. Bring the mixture to a boil and do not stir, or else you will cause crystallization. When it starts to brown, swirl it gently by moving the pot around. Continue to cook until it becomes light amber in color, then remove from heat. First, you will dip the cream-puff shells in the warm caramel: Place a long piece of plastic wrap flat on a table and begin to dip the top part of the cream-puff shells one at a time in the caramel. Once dipped, place them caramel side down on the plastic wrap. Continue until you have dipped all of them, reheating the caramel if it hardens during the process. Fill a pastry bag with pastry cream and fill each dipped cream-puff shell with cream. This is easy because the shells are attached to the plastic wrap, so all you have to do is stick the tip of the pastry bag into the exposed bottom of the shell and squeeze some cream into it. Now, build your tower! The tower is hollow on the inside. 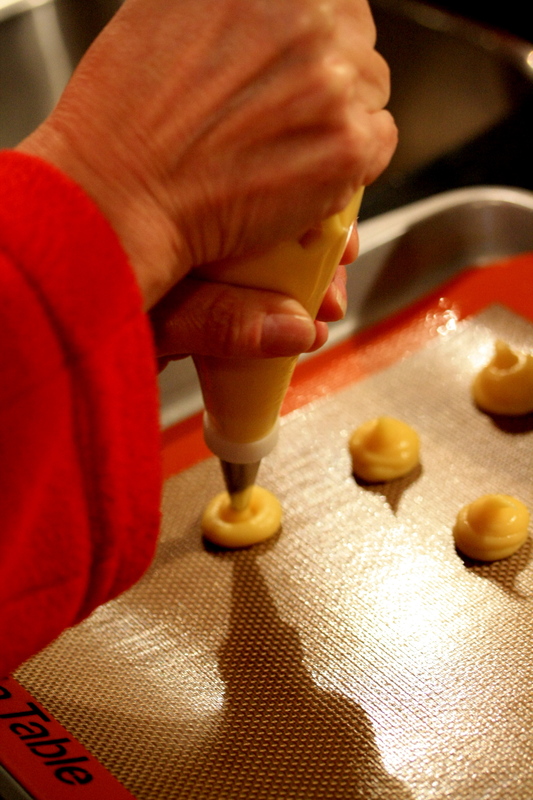 Dip the side of the foundation cream-puffs in reheated caramel and arrange them in a circle on a wide plate. 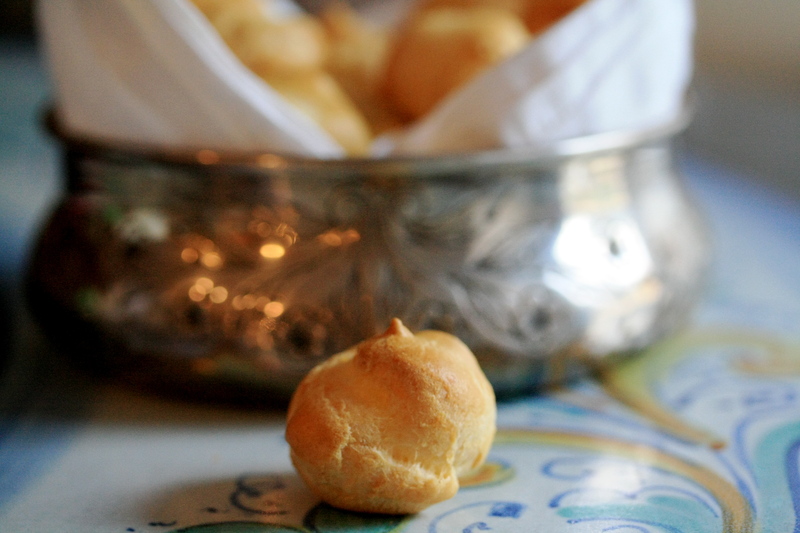 Then, just continue dipping and stacking until you use up all the cream-puffs. 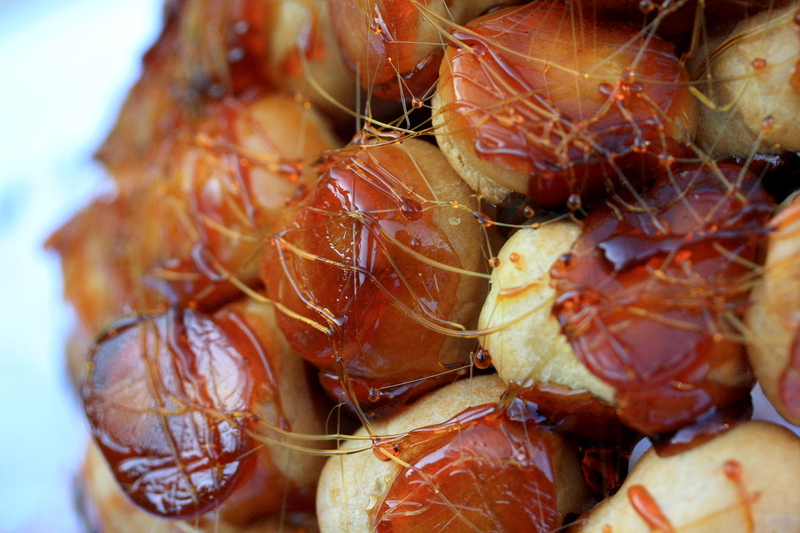 Once you have your tower, use a fork to drizzle the caramel around the tower. You can even create interesting caramel decorations to put on top of the tower. 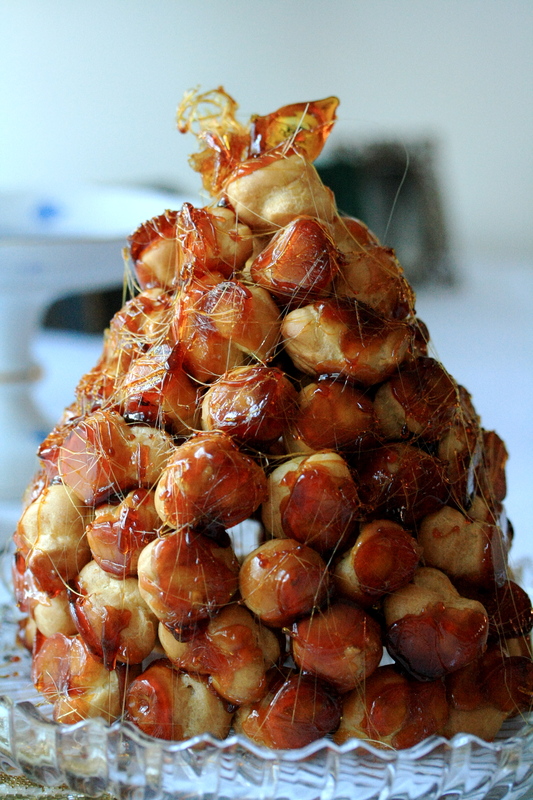 Congratulations, you have made a croquembouche!